Cali has a reasonable claim to being Colombia's football capital. Cali football teams have collectively won more league championships than any other city (21 following America's victory in the 2008 clausura season). Cali and the department of Valle del Cauca have also produced many of Colombia's best footballers, among them the eccentric Faustino 'El Tino' Asprilla who brought some flair to Parma of Italy, and then Newcastle United of England in the mid-90s. He was a late addition to Kevin Keegan's terrific 95/96 squad that somehow threw away a 12 point lead at the top of the Premiership to Manchester United. He famously scored a hat trick against Bracelona in the Champions League. 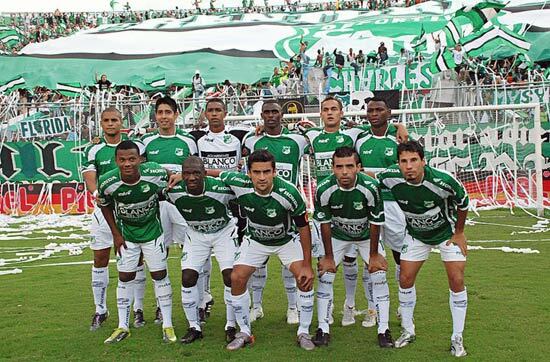 The city of Cali has two big football clubs; America de Cali and Deportivo Cali. 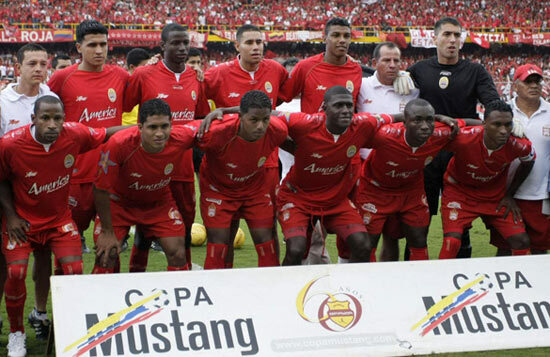 The bigger of the two clubs in the city is America de Cali, also known as the 'Red Devils' (which is their club emblem). They are one of the 'Big Three' clubs in Colombia (along with Millonarios and Atletico Nacional). The rise of the drug cartels in Colombia in the 1980s had a big influence on football. The Orejuela brothers, heads of the Cali Cartel, pumped masses of money into America de Cali. This transformed it into a kind of 'South American Real Madrid', with many of the continent's best players (including World Cup winners from the 1986 Argentina squad) signing for the Cali club. The team enjoyed huge success on the field winning a remarkable 5 consecutive championships from 1982 to 1986. America de Cali have managed to read four finals of the Copa Libertadores in 1985, 1986, 1987, and 1996. However, remarkably, they lost every final. In its early days, America de Cali were an amateur team. One of the teams most important members was a dentist known as "Garabato". Angry at the team's decision to turn professional, he is said to have placed a curse on the team saying that "If the team is professionalised, I swear to God it will never become champion". This prophecy remained true until 1979 when they finally managed to win their first title. However, some believe the curse to still be in effect following the team's four losses in finals of the Copa Libertadores. 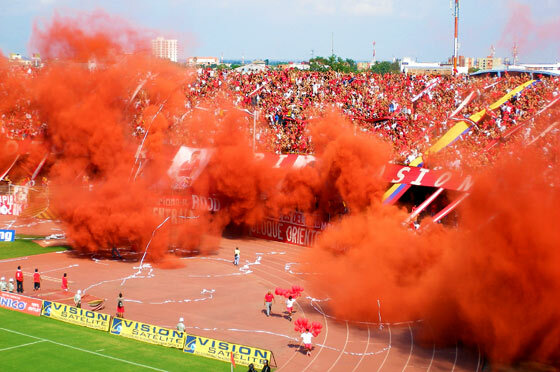 America de Cali play thier homes games at the Pascual Guerrero stadium which holds some 33,000 spectators. Deportivo Cali, who play in green shirts and white shorts, have also enjoyed some success over the years, particularly between 1965 and 1978. Deportivo Cali shared the Pascual Guerrero Stadium with their city rivals for most of their history, but since 2010 they also play home games at the new Estadio Deportivo Cali, which holds 55,000 spectators. 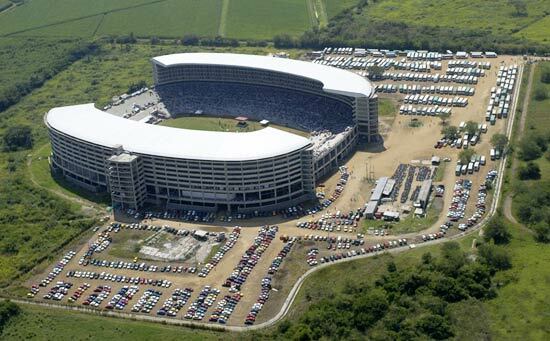 The Deportivo Cali football stadium is located ouside the city limits on the way to the small city of Palmira. 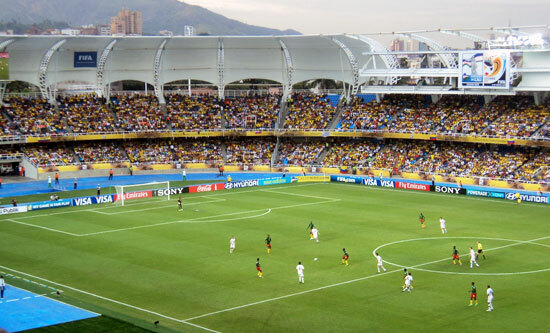 It is the first Colombian football ground to be located outside the city limits. 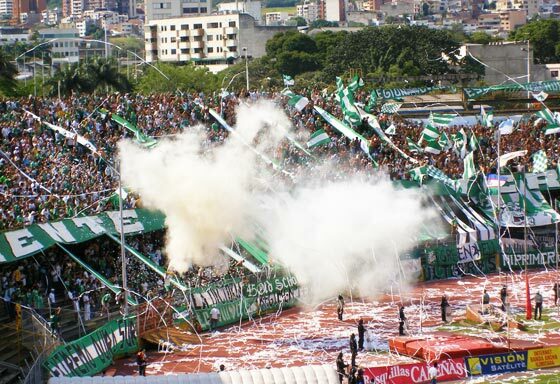 The derby (clasico) match between America and Deportivo Cali is an amazing spectacle and highly recommended! You can usually get tickets quite easily for these 'clasicos'. If the game is sold out, you'll find 'revendedores' (ticket touts) selling tickets outside the stadium on matchdays. Be careful though - make sure you know what an acceptable 'marked-up' price to pay is, or you may well get ripped off!